We have two cats – and they are each sooooo quirky. One of the cats carries a slipper or toy around the house calling (it sounds like she’s crying, but she’s not…she just makes that calling sound…weird). The other cat has a fascination with water. She LOVES drinking from a running faucet. I was sure to have the vet check her out because I’ve heard that can be a sign of some cat illnesses, but she’s fine – she just loves running water. So instead of fighting her off each and every time I am at a sink, I decided to get her one of those cat water fountains. What a GREAT idea that was – she LOVES it! And finally, I get some peace when I am anywhere near a sink. Let me tell you about the original cat water fountain we used, and then the new AWESOME one we just switched to. I’ve updated this post to reflect my feelings (and the cat’s feelings) after using it for a week. Update 3/21/207: We’ve been using this same cat water fountain for well over TWO YEARS now…and STILL love it. It still works perfectly and best of all – our finicky cats still LOVE it! Absolutely one of the best purchases I’ve made for my fur babies! This is the first cat water fountain I tried. We used it for about a year or so and it gets the job done. Here’s what it looks like and more details about it. 1. 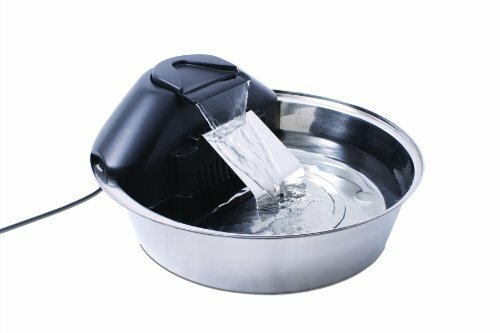 That clear plastic part in the back is like a water jug – you fill that with water, then tip it over and install it onto the water fountain. Yep, it can get messy – especially when you’re as “graceful” as I am…lol! 2. It’s plastic and as hard as I tried, it never felt like it got clean. So yesterday I poked around and found a new cat water fountain that I’m excited to try. It’s called the Drinkwell Zen – and my first love about it is that it’s stainless steel. Will be MUCH easier to clean and to keep clean. Secondly, it’s such a basic design that makes sense. Just fill the stainless steel bowl with water, put the pump part on the top and plug it in. Simple – just what I’m looking for. I’ll review it later when I’ve used it for awhile to give my real use review and feedback. I got mine on Amazon here…. it was very affordable – especially since it’s lasted for years so far. Cat owners LOVE it! Just read these awesome reviews they’ve left. Update One Week Later – We Love It! 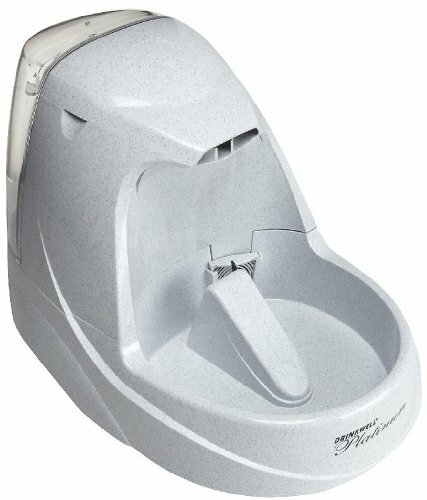 We’ve been using this new “Zen” water fountain for the cats for a week now. Let me tell you something… it’s awesome. Was SO easy to set up… just rinse the included filter with cold water, pull that black pump part off and then slide the filter in where instructed. Fill with water. Plug in. Done. The gray and white cat watched every.single.move I made while setting this up for her. As soon…literally as SOON as I plugged it, she was drinking out of it. The black long-haired cat, doesn’t really like to drink from running water, so this new water fountain makes her very, very happy. The bowl is plenty big enough that she can put her head in to drink her preferred way and not get her ears or head wet. 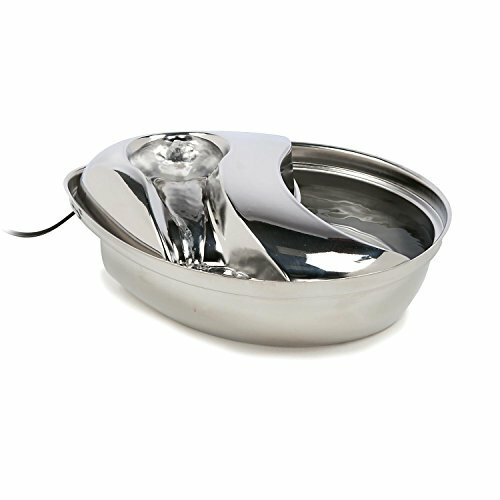 A total TWO PAWS UP for the Zen pet water fountain! Oh, and I don’t see any reason why dogs wouldn’t like it as well. It is a good size bowl – probably what they’re used to drinking out of already. ← 10 Hot Kitchen Gadgets – Do They Work or Just Hype?